For many retail businesses, summers can be a challenging time to maintain steady revenue. This week, I’m going to focus on a strategy that could bring quick revenue into your business. A lot of the marketing buzz for ecommerce businesses has been around using social media to build your brand. As the experts debate the real value of a Fan or a follower, there is still a proven way to quickly increase your revenues in a measurable way. If you ask almost many ecommerce business owners, they will tell you that search marketing is imperative to their success. Some business owners invest heavily in search engine optimization to increase their organic search traffic. Others invest more heavily in pay-per-click advertising campaigns. I’m a proponent of both. But if you want a quick hit, you need to invest in PPC ads. If you have not been watching PPC ads in the last year or so, you might want to investigate, and then some rework on your ad campaigns. I think you’ll see the potential for a quick increase in your revenues with better-constructed and targeted PPC ads. I’ve been amazed at how things are changing in search marketing. The biggest transformation is the importance of being in the top three positions on Google for its PPC ads. I’m focusing on Google here, but many of these features and tactics can also be done on the Microsoft adCenter platform. I’ve been buying many new things for our house and cars in recent months. I do almost all my shopping online and I almost always use Google. I used to gravitate to the organic search results before I noticed any PPC ads. In the last month, virtually everything that I ordered was originated with a PPC ad. When shopping, I find the organic ad content to be far too general and non-compelling. The PPC ads that I saw included relevant information that drew me to the underlying websites. If the advertisers had well-constructed landing pages, I was practically sold. I still push myself to compare prices and do some level of product research. But in most cases, I went back to the original store to make my final purchase. My wife and I have an active hummingbird community outside our kitchen window. Our hummingbird feeder is old and needs to be replaced. 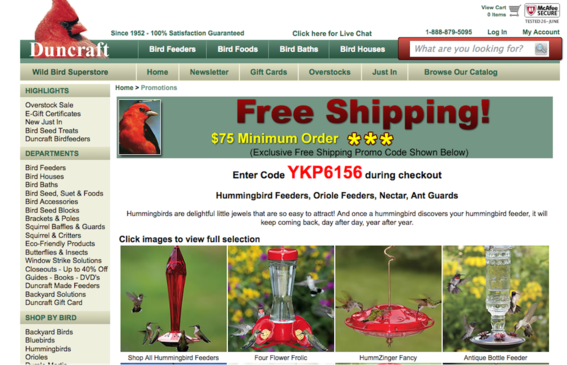 So I searched this morning on Google for “hummingbird feeder.” Here are the results. A well built ad can convey a lot of information in a small area. Let me break this down in more detail. I was immediately drawn to the top ad. It’s clearly selling hummingbird feeders. The company is established, having been in business for 60 years. It stands behind its products with the “100% Satisfaction” policy. It provides links to its main categories, and it even offers a subscribe link for its newsletter. That’s a seriously good use of available real estate. The second listing is also good. The company included its store rating and a reference to a large number of seller reviews. Now, let’s look at organic results below the ads. They are not so compelling. On the right hand side, there are eight images of specific products from Google’s product feed. Those draw your eye and are likely to get a click if the price and image are appealing. 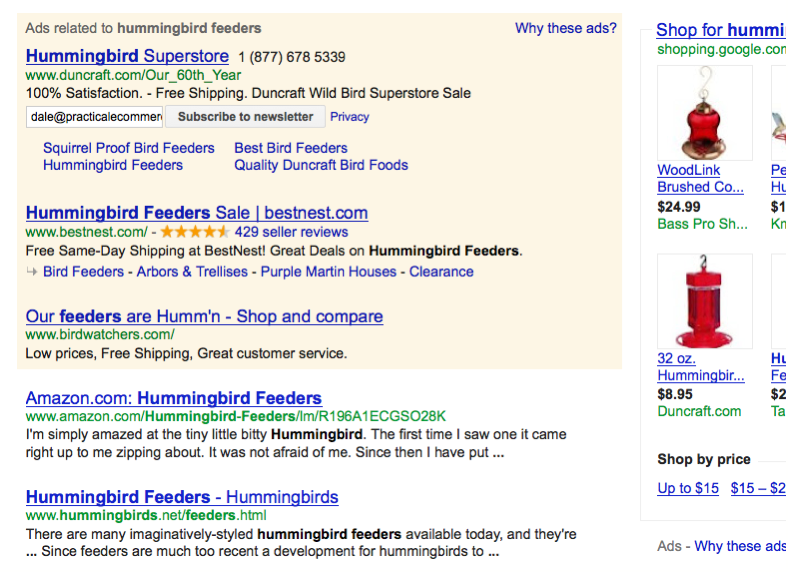 When Google starts charging for this ad space in the fall, I recommend to merchants that they invest there. In my previous business of selling jewelry online, those product ads had the highest conversion rate. Let’s look at another example. 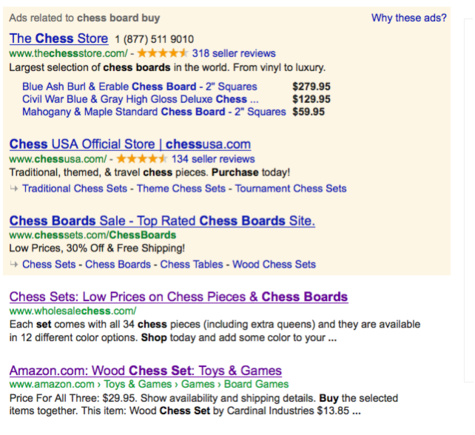 I searched for “chess board buy” in my efforts to find a chessboard. Focused ads can provide a more directed experience than organic listings. The Chess Store has a solid use of real estate in it top listing. It highlighted specific products rather than using site links. And for all of the top three ads, I am more likely to click on them than the organic listings below. When I was running my own pay-per-click campaigns, I tended to target the 4 to 8 spots for ads on the right side. With more features that are now available to create ads — like the ones shown above — it is probably worth testing these more robust ads and targeting the top positions. Google now offers reports that show conversions by position, which is worth investigating. PPC ad campaigns always had a higher conversion rate for our business than our organic traffic. There is a cost per acquisition involved, and for the higher ad positions, you will also have a higher cost per click. But your cost per acquisition may actually be the same or lower if your conversion rate increases. The second factor to help increase the chance of a conversion is the landing page. Let’s look at the landing page for the “hummingbird feeder” search on Duncraft.com. A well-built landing page is necessary to capitalize on a high-traffic ad. This is well-constructed landing page. It contains best selling products, an offer, and a highly visible live chat, phone number and search box. My guess is that the conversion rate is pretty high for this ad and landing page combination. The last part of the PPC equation is keywords and bidding. It’s important to invest in the right keywords. So make sure you know which ones actually convert for you. Experiment with the best bid strategy to achieve the top positions. This can be expensive. You’ll need to closely monitor the results to make sure you aren’t overpaying and exceeding your budget. Pay-per-click advertising is changing rapidly. There are many more options and new ways of constructing an ad. In this article, I’ve described three elements of a pay-per-click campaign that drive quick revenues. Be sure to monitor your results closely in Google Analytics. Cut your losses quickly and invest more heavily in the ads that work.